1 How to increase my earnings from paid surveys? 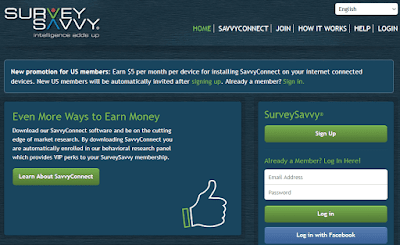 Joining online survey sites are one of the best and simple ways to make money without investment from your home. 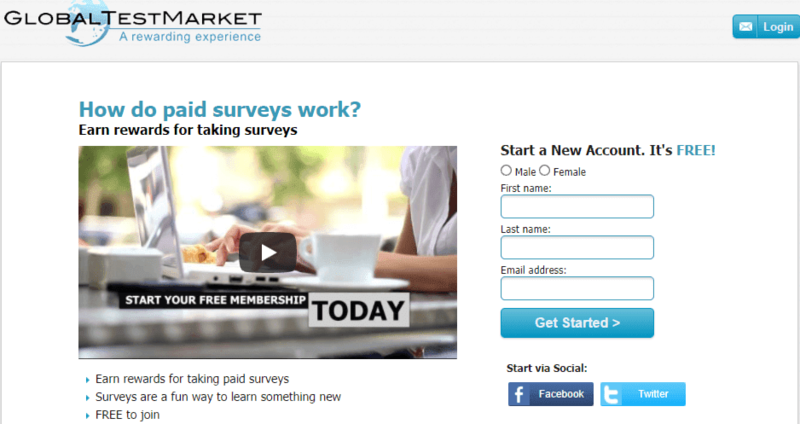 There are few legitimate survey websites where you can join free, complete small surveys & gain $+500 per month from your own house. 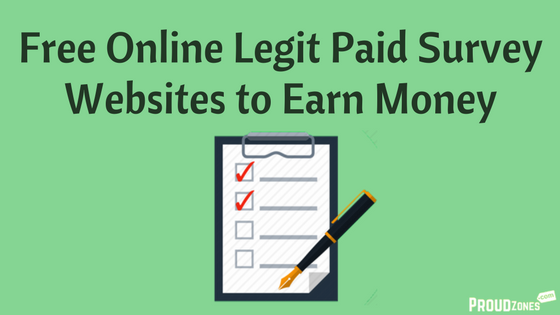 These types of legit online jobs are suitable for housewives, students, retired peoples and for those who want to make some extra part-time earnings. Most of these paid surveys are available for the peoples living in US, UK, and Canada only. But, there are few sites for international users, where people from Asian countries like India, Nepal, Bangladesh can join and start earning! So, you need to be clever enough, to grab all the opportunities, such as instead of joining 1-2 sites, try to join 6-12 survey websites to get the maximum revenue. Doing this will ensure that you are getting the maximum paid surveys to make more money online. How to increase my earnings from paid surveys? Suppose if a person joins 10 survey sites and he is making Rs.500 from each, then he can accumulate (10 sites x Rs. 500 = Rs.5000 per month) which can be considered a good amount for students or housewives, to begin with, and later you can join more similar survey websites to maximize your monthly income. Just register on these sites & login to the sites regularly to check for available online surveys. You need to complete the surveys as soon you receive in your account otherwise it will get expired. Below I’ve listed out the best genuine survey websites, where everyone can participate, complete surveys and earn the cash rewards via Bank or Paypal or through your Payoneer account. 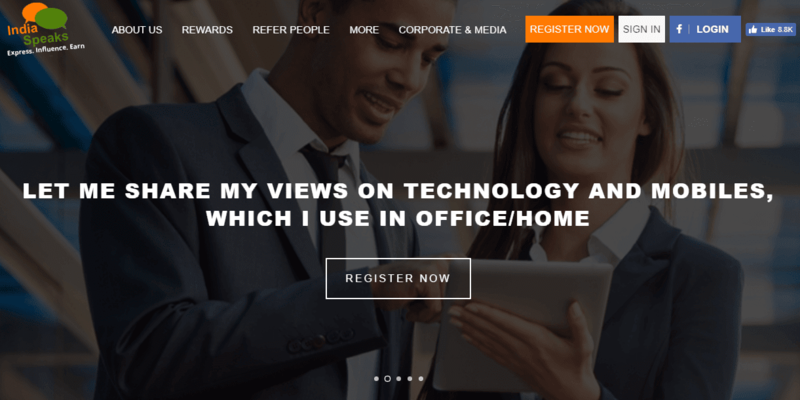 There are no doubts that iPanel online is one of the best online survey collecting company for market surveys and it is ranked within the top 10 of the survey companies throughout the world. The best part about iPanel is that they will pay you in points, every 10 points are calculated as 1 INR. For example, if you are able to make 10,000 points per month, then you will earn (10,000➗10=1,000) per month. So, the earning is not so bad after all. You will receive points instantly typically between 1-100 for each survey you complete, and you will also receive 1 point every day just to log in. They also run some special lucky draws every week and reward their winner with a satisfying amount. You can redeem your earnings through Paypal and Giftcards. Toluna is one of the top community websites and survey providers with more than 60,00,000 members. It’s more like a social networking website, where you can follow people, they can follow you back and even you can post messages on their wall. Earn by participating in the paid survey or profile surveys. Gain by creating quality contents polls and topic. Earn more by inviting your friend to sign up with Toluna. 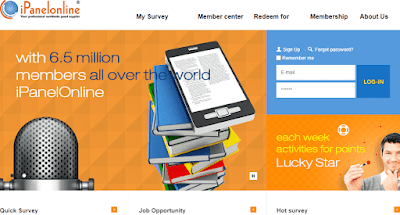 Valued Opinions is another popular online surveys company owned by Research Now and they pay more than 5 million peoples every year for completing paid surveys. They have a tie-up with great brands for online surveys. After joining valued opinions you will be able to engage in various online surveys through emails according to the interests you provide in your profile. 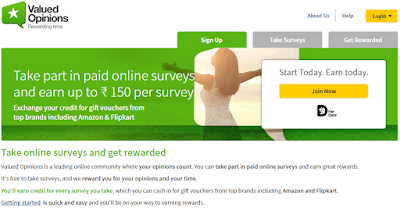 You will receive around INR 30 to INR 60 for every average survey you complete and the reward will be credited to your Valued Opinions account. As soon as you reach the threshold amount INR 400, you are allowed to withdraw your income via below ways. You can withdraw your earnings via Paypal, Flipkart E-Voucher, and Amazon Gift Cards. Global Test Market counts among top paid survey sites in the World. They have been operating since 1999 and hence one of the oldest and best sites for a paid online survey. Global Test Market serves more than 1400 clients in more than 60 countries, and they have paid more than USD $32 million to their international members in 2014. They mostly provide surveys ton topics such as Global Issues, Restaurants, Automobiles, Consumer products, Current events, Electronics Gadgets. They will reward you typically 5-40 points for every online survey you complete and 5 points for your time if you don’t qualify. Once you reach 1000 points, you can withdraw $50 (around INR 3250). But it takes a long time to reach there. You can redeem your income through Checks, Paypal and E-Voucher. 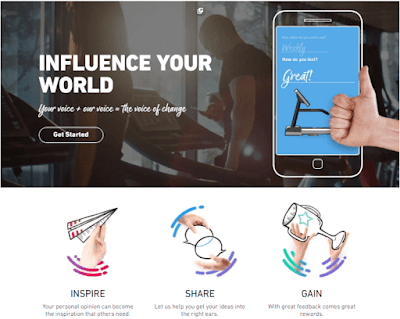 India Speaks is another survey provider company made in India, where users can share their opinions to help develop products and services of multinational companies. 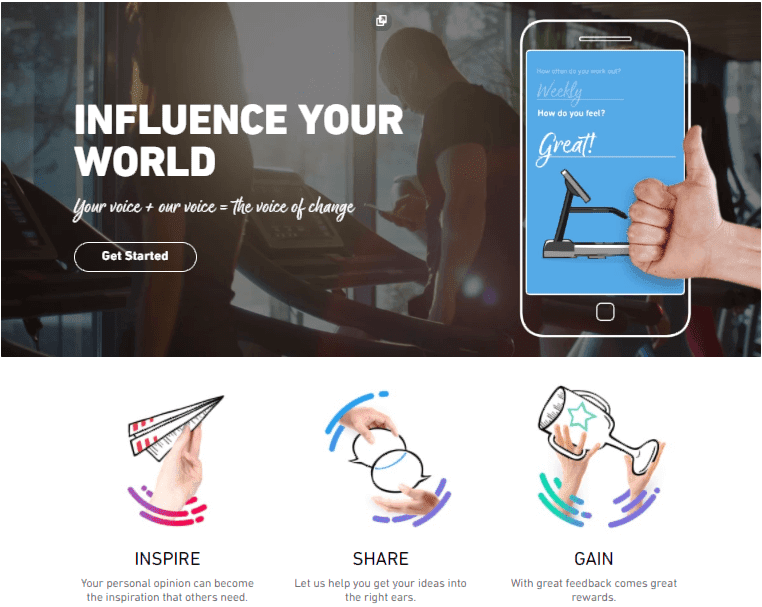 Their mostly users are professionals, homemakers, Business Decision Makers, Students, Retired Peoples, Entrepreneurs, Doctors, IT Decision Makers, and Teenagers representing a good mix of regional and cultural diversity. After you signed up, you will be invited through email to participate in the paid online survey and once completed, you will be rewarded with around INR 20 to INR 50 for each successful surveys you take. Easily redeem your revenue via Paytm cash, Gift Vouchers, and mobile recharge as soon as you reach the threshold amount. Swagbucks is an all in one earning source with more than 15 million members worldwide, where you can participate in a variety of online activities, such as searching on the web, shopping, taking surveys, playing games and watching videos etc to make money online. They will pay you in SB points once you complete a task, 700 Swag Bucks equals $ 5. You need minimum 700 SB in your Swagbucks account to be eligible for withdrawal through Paypal, Gift cards, Amazon Gifts, etc. Permission Research is one of the top companies deal with paid online surveys and it is a division of ComScore, Inc., one of the nation’s largest Internet research firms, boasting more than 2 million members worldwide. Many top companies trust Permission Research for getting valuable insight into Internet trends and behavior. You can get paid cash offers or gifts for completing every paid survey. Their main goal is to help companies understand digital content trends and patterns so that those companies can give people like you what you want. You can get paid with cash or gift cards through Paypal for participating. SurveySavvy is another online surveys provide company operating online surveys since 1999. They will pay you high commissions for participating in their surveys and you can also earn extra through the referral program. After joining their site you need to complete your member profile to provide the information to target various demographic groups according to criteria established by their clients. When your profile matches their basic criteria for a specific e body of the survey, they will invite you via email to participate and credit the mentioned fair to your account as soon as you complete the surveys. There is no guarantee as to how many surveys you may receive or participate. All the surveys you will get is based on your personal profile, so complete your profile as soon as you sign up to get the maximum surveys. Once you have accumulated more than $1 USD, you can request payment by using the “Request Payment” tool under the Account section once logged in and redeem your income via Paypal and Gift Cards. InboxDollars is one of the best websites where people can make money by participating in paid surveys, reading emails, playing games, watching ads, referring friends and signing up for offers. 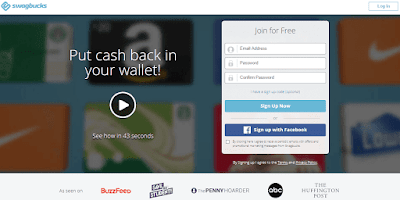 They provide direct cash rewards to millions of their members for their everyday online activities. The advertisers will only pay for the results you deliver, such as clicks, registrations, views, downloads and other targeted activities. You will get free $5 signup bonus offer creating a new account and as soon as you reach at least $30.00 in your account, you are allowed to request payment. You can payout your earnings via eCards, Prepaid Visa cards, etc. They don’t offer payouts via PayPal or Direct Deposits. Paid surveys are not a get rich quick scheme so, you will be paid off depending on the surveys you complete. In order to get maximum surveys, you need to complete your profile first as soon as you sign up, provide your real and accurate information, regularly check for new surveys in your dashboard to increase your income through paid surveys. Have you been using other legit survey websites? Let me know in the comment box below!